It’s been a while since my last post! Not what I had intended when I started this blog, but Mother Nature has been kick’n my buttocks. Finally, after recovering from Irene and Lee, I have been able to get back into the shop. Not to mention, I have been busy with the new house chores as well. The new shop is coming along. 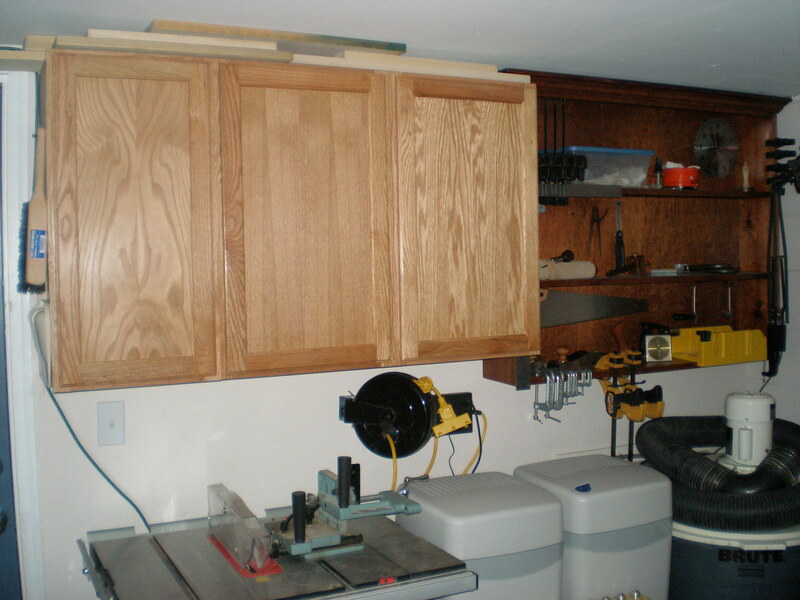 I purchased some nice oak cabinets from the home center during a 20% off sale. On the same wall, I put up a large shelf unit (converted from an old bookcase). The bookcase was built by my grandfather’s brother a long time ago, and I have been saving it from the dumpster for a couple of years now. So far it has been serving me very well on the wall. The next step after I finish the year plus nightstand project (to my credit, I was without a shop for 8 months), is to build my long overdue workbench. 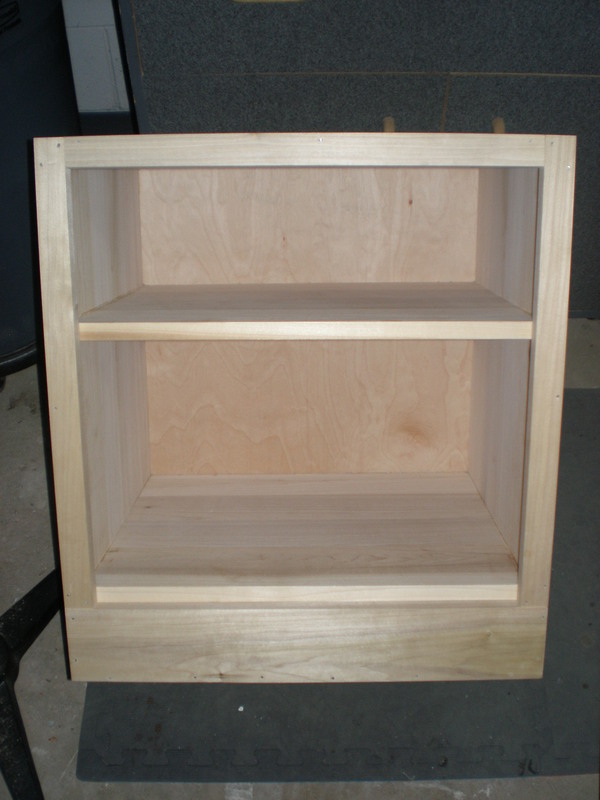 It has been in the finished carcase stage for a long time. This past week I was able to finish the face frame. 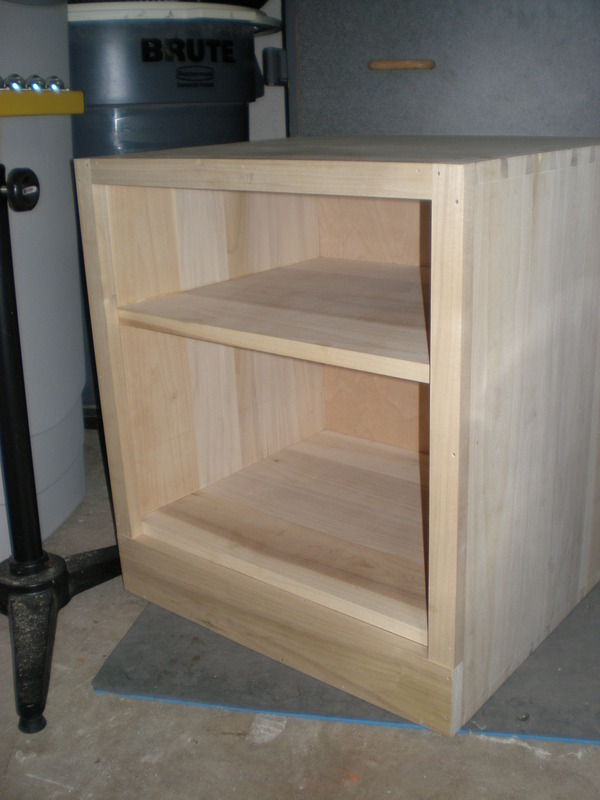 I am starting to convert to a hand tool only maniac, so I completed this entire task with hand tools. The hardest part was ripping the thin strips (1 1/2″) with my crosscut saw. Yeah, that’s right, crosscut. I don’t own a rip saw other than my table saw, and I wasn’t going to cave in and power it up. It took a while, and the cuts were a little rough, but they cleaned up perfectly with my low angle jack and block planes. My next purchase will definitely be a rip saw…just need to sell something to scrape up the cash. For the crosscutting, I built a nice bench hook with some scraps…its part butternut and part poplar. It worked great and I surprised myself how well I could saw. Almost perfectly square…beginers luck? Maybe, we’ll see. After prepping all the stock, I planed the two sides and top face frame pieces to the same thickness. The bottom face frame piece stands a little proud. I did this purposely, as it gives a nice reveal on the bottom almost as if the rest of the face frame is supported by it. The bottom face frame was the first I attached to the carcase. I just used some nails, drilling first, with no glue. Then I attached to two side face frame pieces in the same way, by showing it to the carcase and marking it with my knife. Naturally, last to go in was the top piece. Then I used my block plane to flush up the frame to the carcase sides. Did the process take longer than it would have with power tools? Not sure, I was having too much fun working with out power…there’s just something about it. When I tell people I am going to give up the power, they freak out…it’s kind of funny. 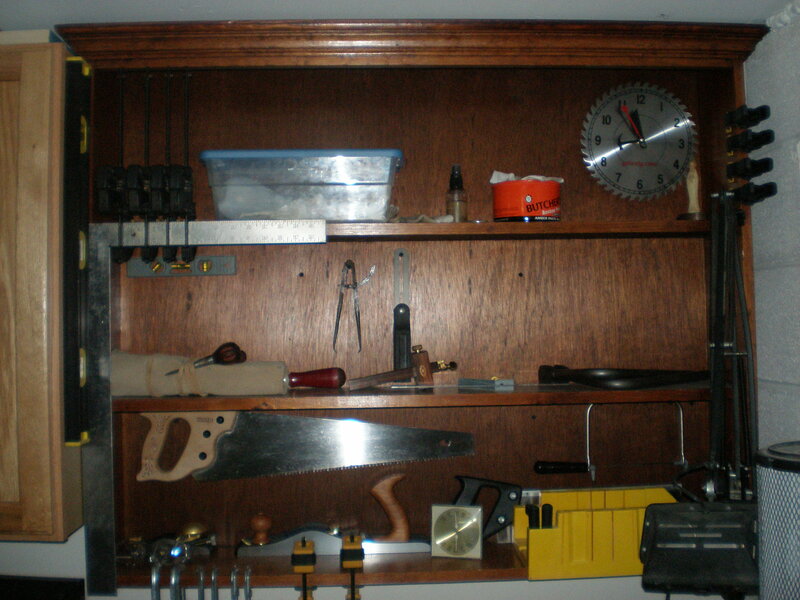 It is hard to explain why I am drawn to unplugged woodoworking…perhaps it’s the connection to the tradition of woodworking, or the reduction in noise & dust, or the space it saves in my new shop. I think it might be all of those…well, yeah it is. I think the greatest thing pushing me down this course is: I feel like I have been cheating using machines to do the work that I could easily do with hand tools. I am not sure why. 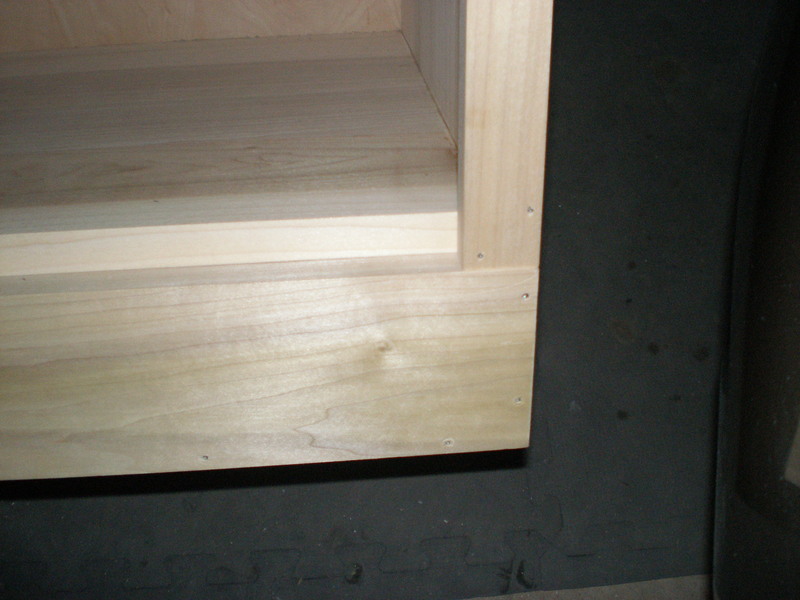 I just know, that now I am using hand tools, I am getting so much more satisfaction out of woodworking. This entry was posted in furniture, hand tools, nightstand, Philosophy, VCF, woodworking, workshop and tagged furniture, hand tools, woodworking, workshop by villagecustomfurniture. Bookmark the permalink.